Pinot Grigio if you’re in Italy, or Pinot Gris if you’re in France, is on an upswing in the United States. Considered the “new Chardonnay” due to it’s rising popularity in the past ten years, it’s an easy sipping wine that can wow both the knowledgeable and the casual drinker. From everything I’ve read, there are no “rules” for Pinot Grigios – they can be barrel aged in oak or stainless steel, left completely dry or with a bit of residual sugar left behind. This will inevitably change the wine from producer to producer, and the color will range from a pale gray to a light pink. I’m contrasting two very different Pinot Grigios today. A friend, Christine London, poked fun at me and asked when I’d be reviewing Two Buck Chuck; so the next time I happened to be in Trader Joe’s, I picked up a bottle of their Pinot Grigio to give it a taste. Christine, this one’s for you! 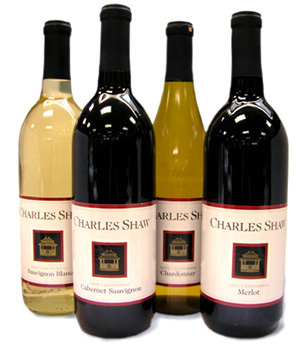 Charles Shaw Winery Pinot Grigio, 2010, California $1.99 at Trader Joe’s. Napa and Sonoma Valley, California Alcohol 12.5% by volume. For more info on the wine maker, go here. On the Label: The label was uninformative, which in my book is not a bad thing. My take: Eh. It’s not a bad wine. Please do yourself a favor and drink very cold. If it’s a dinner wine, and I highly recommend it as such, keep it in an ice bucket. It’s got a high acidity level, which cuts through spicy foods well. If you’re having a party, consider stocking up on this wine as a mixing wine – white wine spritzers on a hot summer day, with a splash of lime or lemon – this wine is excellent for that purpose. If you’re sipping it poolside, make sure you have a sharp cheese and some crackers to go with it as you’ll enjoy the wine more. In these uncertain economic times, the producers of all the Two Buck Chuck varietals are making wines available to a wide population at ridiculously low prices. If you like them, then your wallet will be ecstatically happy. If you don’t, then the hunt for inexpensive and tasty wine continues. My rating: ~Drinkable~ especially for the price. I much prefer other wines, but will come back to this one. Maybe it just needs a year in the bottle? I’ll see if I can find a 2009. On the Label: “Roots. Rocks. Intrigue. 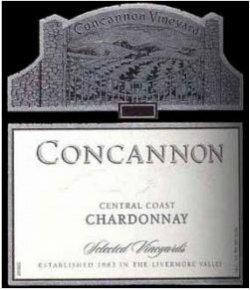 Since 1883, Concannon Vineyard has been handcrafting fine varietal wines from grapes grown along the Central Coast of California, a diverse region that stretches north from Santa Barbara to the San Francisco Bay. We carefully select the most ideal vineyards for growing each varietal and craft this expressive fruit into superb wines. My first impression: A friendly wine. Why? It had a screwtop. Oh now, stop it. Don’t lift your nose and sniff. Screwtops make complete sense. Cork is expensive, and can fail. A screwtop can’t, especially when they add a sealer to it underneath the top. From my readings, South Africa and Australia don’t have the same “cheap” connotation for screwtops as Americans do, and they’ve whole-heartedly embraced the screwtop on their wines. I say, good for them! And I hope America soon follows suit. Now to the wine itself: I could definitely smell and taste the melon and honeysuckle, which surprised me. This is a light, refreshing wine with a zing on the aftertaste, as well as a hint of sweetness to it that makes it an excellent sipping wine. I paired it with a roasted chicken, mashed potatoes, fresh green beans and a salad and it made the whole meal feel summery and fresh in the heat of the evening. I find I’m liking Pinot Grigio a lot, and I’ll pick it up when I need a refreshing white wine. Overall it’s a friendly varietal that pairs well with lots of different foods. Several are terrific sipping wines, and they make a nice change from Chardonnay at a summer party. My rating: ~Very Drinkable~ . A bargain even when not on sale! REMEMBER: Your tastebuds may vary. What I love, you may hate, and vice-versa. So if it’s under $10 and in your taste ballpark, go ahead and give it a try no matter what I’ve rated it. Now, weigh in on screw tops. Yay or nay, and why? Is it more romantic, having to uncork a wine? This entry was posted in Wine Friday and tagged blog, Charles Shaw Winery, Christine London, Concannon Vineyards, honeysuckle, melon, Pinot Grigio, screwtops, Two Buck Chuck, Wine. Bookmark the permalink. Two Buck Chuck is Three Buck Chuck outside of California, no doubt to cover transportation costs. If you’re in Trader Joe’s anyway, try the Contadina (probably not spelled right!) Pinot Grigio – I think it’s closer to $3.99 but enjoyable. As far as screw cap vs cork, I prefer those for so many reasons, not just the ease of opening. As long as I don’t goof and try to use the corkscrew on the top! Good point about the costs outside of California, Mona. Still, three bucks for a bottle of wine ain’t bad, yes? I’ll give the Contadina Pinot Grigio a try the next time I’m in Trader Joe’s – thanks for the recommendation! I’ve never been a big fan of Pinot Grigio, but I may give that second wine a shot. The melon and honeysuckle combo intrigues me. As to the screw top/cork, at first I was a wine snob and wanted cork only. But a scientist friend of mine explained that cork is at times less available and more expensive and that there is nothing problematic about a screw top. Since then, I have embraced the more conveniently opened wines just fine. I don’t notice a difference in taste. I’m good with screw top or cork – especially since my Houdini makes the cork wines open much easier as well. Julie, I agree. I, too once had an attitude about screw tops until it was explained to me. Now I much prefer them just for the ease of opening. A lot of wineries have gone to those plastic type of corks, too…I don’t know the ins and outs of those but they seem to work. OKay, have now tried Concannon Pinot Grigio and must say it it really good! I wholeheartedly agree: Very Drinkable. Oh, excellent, Lynne…I’m so glad you liked it! Regarding screw tops: We just opened a bottle of red wine from Australia, and I did just what you implied–I wrinkled my nose, sneered, and was all prepared to make a scathing comment. Instead, after enjoying the bouquet, and taking a tentative sip, I had to admit, it was a nice little wine. So much for snobbery! And if I want romance, well, I can always be distracted by hugs and smooches…. Rhubarb, I had to laugh – I never would have thought you’d been the sneering type! But I’m so glad you enjoyed the wine. Screw tops are amazingly efficient! What wine did you have, by the way? I missed the party. : ( But yeah, we Aussies are renowned for our efficiency. Ha ha. Anyway, I do like Pinto Grigio, especially in the summer. There’s something cool and crisp about it. I can’t recall the name of the wine I’m thinking of but I bought it at Trader Joe’s and it has an almost frosted appearance to the bottle, and a blue label, maybe a woman’s head on the label. My memory is shot. Probably from killing off brain cells with wine. I remember I first bought that PG because it looked so pretty, but it also did taste good. I’ll have to take a look when I’m in there this week, and maybe buy a bottle or two. If I do remember to do that, I’ll let you know next week.